Some of you may have noticed I’m fond of wood. My spindles are made of beautiful woods by skilled craftsmen. I have lots of spindles! But there’s always room for one more. I was a bit uncertain about the placement of the whorl. I’m a dedicated top whorl lover. As you know, that doesn’t have much to do with the performance of the spindle, it’s a personal preference only. After a couple of days of pondering, I decided to buy a bottom whorl. 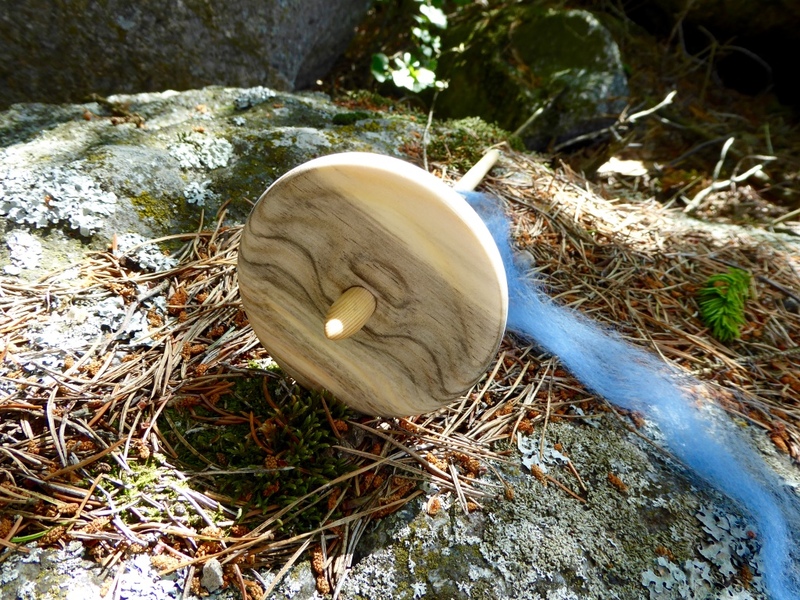 I learned to spin on a bottom whorl in the 80s, I wouldn’t have problems spinning with one now. After all, it’s a long time since I last purchased a bottom whorl, so why not step out of my comfort zone? I’m happy I bought the bottom whorl! It’s a lovely spindle. I love the wood, I love the colours. It’s smooth, it feels nice. The balance is very good. I can use the spindle both supported and suspended – a great advance when you want to spin thin on a spindle that in fact is too heavy for the very fine yarns I usually spin with spindles. I start half supported (only letting the spindle gently touch my thigh, drafting worsted), and when the yarn has enough strength I lift it up and give the yarn the final twist (suspended). Drafting worsted with a supported spindle is possible when there’s a hook. The upper part of the shaft is slightly square, which helps in having a firm grip when you twirl it. Today I took it out and tested its performance in the constantly windy weather we have in our valley. No problems at all! It seemed it didn’t notice the wind! I know Abby Franquemont says somewhere that bottom whorls are better in windy surroundings. now I have noticed that for myself. 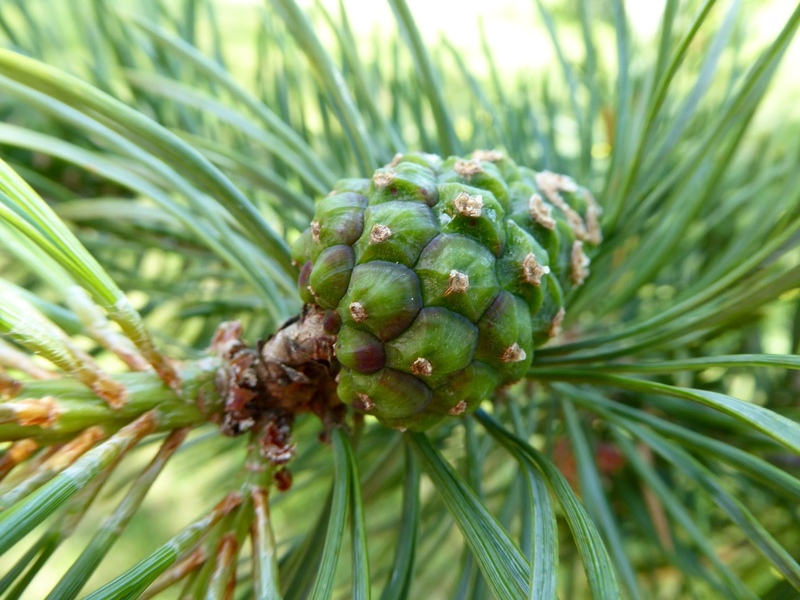 Maybe a seed from this little pinecone will grow up and become a spindle one day? 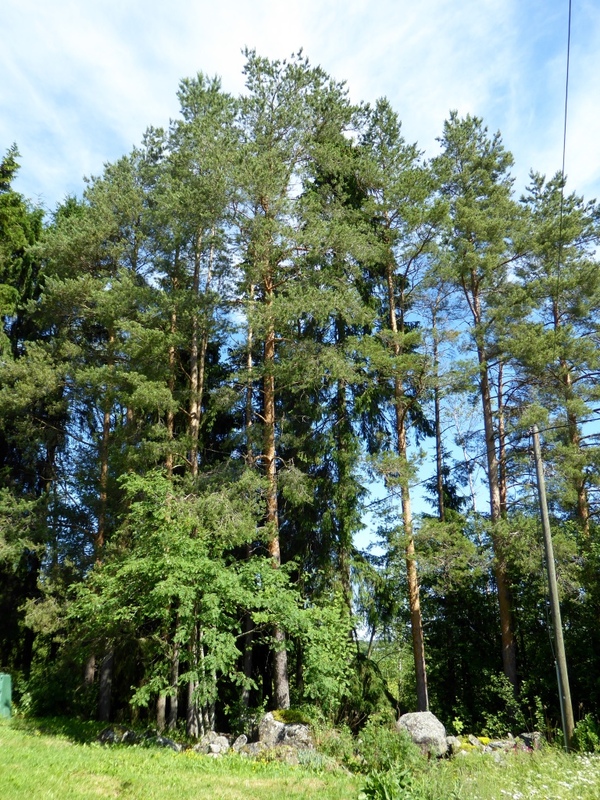 Pines, spruces, and rowans in our back garden. And the very annoying pole that was planted in one of our flower beds one day by the telephone company. Why couldn’t they just dig the cables into the ground? OK, too expensive, I know. June 26, 2016 - 1:10 pm Marilyn F.
A very nicely made spindle – beautiful wood and well constructed. I can see how you fell for it. 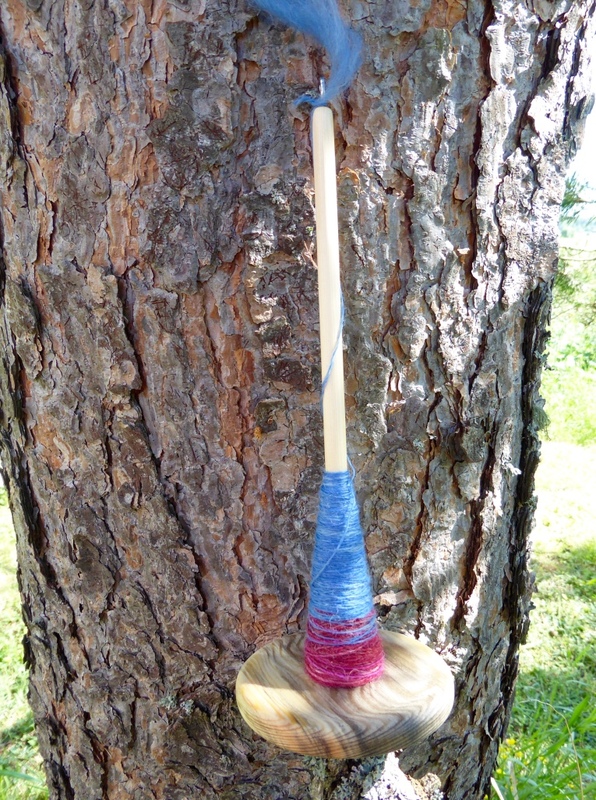 I never thought of supporting a drop spindle to initiate a strong yarn – something new to try. Thanks for the tip and may you have many happy hours spinning with your new spindle!!! Thanks, I’m sure I will, Marilyn! 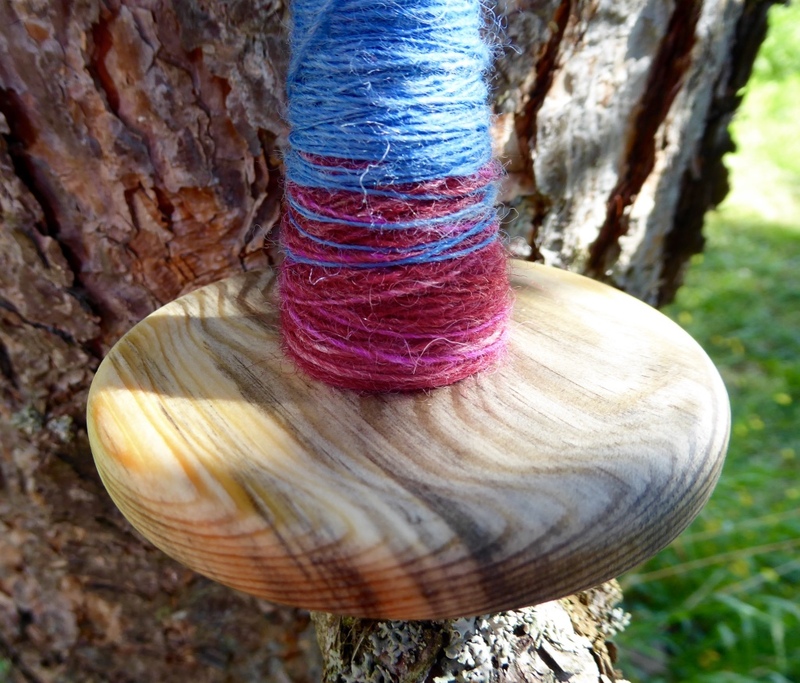 The wood alone would (no pun intended) make one want this gorgeous spindle. Very nice workmanship. Norman Kennedy is fond of a supported spindle. Enjoy. Norman also spins on a Scottish version of the medieval / French / Portuguese hand held spindle. I have two Portuguese spindles, but my wrist doesn’t bend to that kind of spinning anymore. It hurts too much. The bottom whorl from Forsnäs hemman nicely turns into a Pu Yok when you support it. Pu Yok is my favourite version of the supported spindles.